11926-SS-DST is rated 3.7 out of 5 by 50. 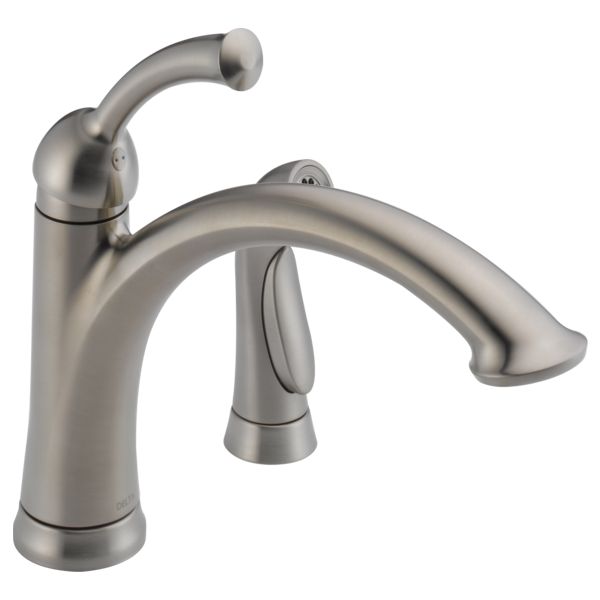 Rated 5 out of 5 by Hillbilly01 from Great features I bought this faucet 3 weeks ago and been very happy with it. I have had a stroke and can only use one hand and this faucet has worked out great for me. Rated 1 out of 5 by ebbers12 from Drip, Drip, Drip! This faucet is beautiful and we really loved it at first. That was a year or so ago. Now it's constantly dripping after being turned "off". Sometimes it's a stream, sometimes it's a drip - either way, not okay. I can't tell you how annoying & silly it is to have a faucet you have to coax into it's true "off" position. Also, make sure you enable the anti-scald setting. The temperature changes VERY quickly, and you will scald yourself more than once if you're not very very careful. The worst part is the dripping. I'm fairly intelligent, and busy in the kitchen. I don't have time for double checking this faucet every time I think I'm turning it off, but time has proven I have to in order to avoid wasting copious amounts of water otherwise. These people really need to re-think the whole "Diamond Seal" thing IMO. Not a good buy around kids especially, for both reasons listed above. 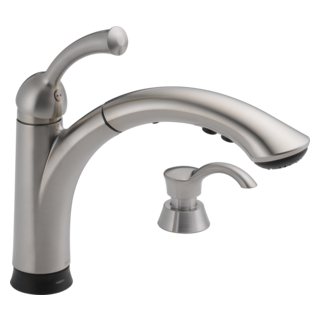 Rated 1 out of 5 by kmmarykay from leaker I purchased this faucet 4+ years ago. The temperature has always been hard to control and for the past 6 months there's a contatant drip in the off position. Very annoyed! Rated 3 out of 5 by jimB from To soon to ask for review Have bought 2 and would not have done so if i did not have long term expectations. Last faucet went 25 years, another brand, and had lifetime warrant tee. Will be happy if yours does same. ask me again in 8 - 10 years. Rated 1 out of 5 by BriRei from Constant dripping after a few years A few years after having the faucet installed in our new kitchen, we can no longer completely turn it off. It constantly drips when not in use. Very disappointed with the quality of this product. How tall is the Lewiston faucet? I need to get an aerator adapter to allow me to use a garden hose with this faucet when brewing beer. Is there one available or recommended? The faucet only consumes two of the 4 holes I currently have on my sink. Does the box contain 2 matching hole covers? There is a trim plate that will cover 3 holes and the sprayer will use the 4th. Is the side sprayer metal? Hi, I just bought your faucet, and I'm trying to attach a Pur water filter to it. The Pur adapters are too short for the deep aerator channel. Is there any way to get an adapter for the sink that can have a filter attached? the lever does not position itself squarely in the off position -?? after I installed the #11926 on the sink( Sink is set also). I notice the lever does not position itself squarely in the off position -?? more lies in a 5 o'clock position rather than 6 . Will I have to reposition the mounting nut and washer so it may not be completely tight ?? The swivel the body to make it square ?? 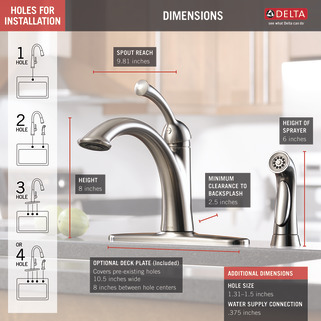 Go under the sink and loosen the hold down nut that secures the faucet to the counter. Have some one else hold the faucet handle in the off position while you slightly rotate the faucet base. 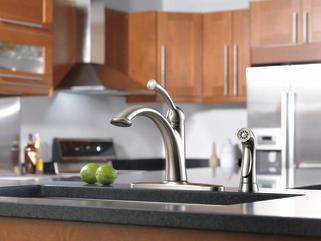 When the handle is in the correct neutral off position, hold it there as you tighten the nut under the sink. Just installed this faucet. Does the spout move past the sink counter to give you full use of both sink sides? If you move it left or right, it stays in the way of one of the double sinks.